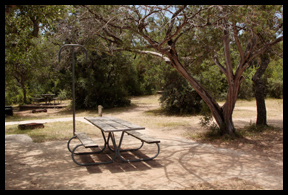 The South Llano River State Park in Junction, Texas offers some of the best tent camping in Texas Hill Country. 14 walk-in camping sites are located at the North end of the camping loop situated well off of the road. A large parking lot adjacent to the camping area is available to park your vehicle and unload your camping gear. A short walk on a paved trail takes you to the small campground where you may select your camp-site from a choice of 14 designated sites equipped with a fire-ring, picnic table and lantern pole. Several sites have a cooking grill. The area is nicely shaded. 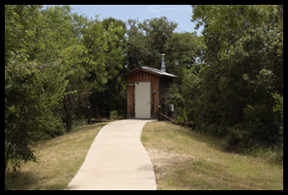 Water is conveniently located amongst the sites and a composting toilet is available for your convenience Two of the sites are ADA compliant. In order to keep this area from becoming overly crowded only 7 of the 14 sites are available to rent on any given night. A limit of 8 people per site is enforced. Quiet time is from 10PM-6AM. The nightly camping fee is $10 per site. An entrance fee of $3 per adult per night is also charged. If you have an annual Texas State Parks Pass this fee is waived. It is recommended that you reserve a site in advance especially for summer weekends. Note: Firewood is available for sale at the South Llano River State Park for $4 per bundle. Check with the park host in sites #2 or #4 for purchase. This entry was posted in State Parks, Texas, Things to do in Texas and tagged family camping on the South Llano River, South Llano River State Park primitive camping, tent camping in Junction Texas, walk-in tent camping Texas Hill Country. Bookmark the permalink. Oh my goodness! What an incredible article. Thank you However I’m experiencing a situation with your rss . I don’t know why I am not able to sign up for it. Is there anybody having similar rss problems? Anybody who is aware of the problem please kindly respond. Appreceiate it. I’m so glad I found your blog! We are planning a trip soon to South Llano River and have never been. We also love camping and have spent the better part of this year visiting State Parks in Texas. Our goal is to visit 12 this year! Thank you so much for sharing such great information!